This article was originally published in Rappler.com on February 16, 2015. 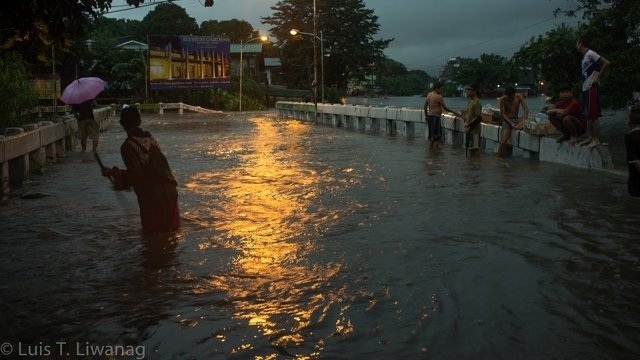 MANILA, Philippines – Cell sites of some telecommunication companies in Metro Manila are now hosting rain gauges to improve the weather forecasting and disaster prevention program of the government. 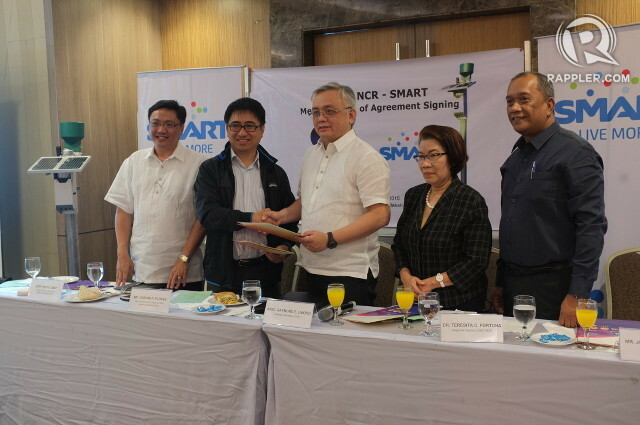 On Monday, February 16, the Department of Science and Technology (DOST) and Smart Communications formalized an agreement for the installation of Automated Rain Gauges in 6 strategic locations in the mega city. This is on top of the 63 rain gauges installed all over the country currently being used by PAGASA to detect and measure rainfall. The 6 additional rain gauges will be used by Project NOAH, the disaster prevention arm of DOST. Four of the 6 rain gauges were installed from 2013 to 2014. Two more will be installed this year. Including the Smart and Sun cell sites, there are already 14 automated rain gauges in Metro Manila. Some, such as those in Marikina City, work in tandem with water level sensors for rivers that overflow during storms. The rain gauges installed in the cell sites have Smart SIM cards that transmit data to the DOST server. If the cell signals get disrupted, the rain gauges also have the capability to send data via satellite technology, said DOST Undersecretary Raymond Liboro during a Monday press conference. Rainfall amount is critical information that gives DOST an idea of how strong a weather system affecting a town or city is. This would translate to giving the appropriate orders for disaster prevention and response on the ground. The DOST-purchased rain gauges are installed within the perimeter of select Smart and Sun cell sites. The sites were chosen by DOST based on certain requirements, including the absence of blockages, like trees, that could get in the way of rain falling into the gauges. “We save around P20,000 to P25,000 ($452 to $565) because without the Smart cell site, we would have had to put up fences around the rain gauges and spend for security and maintenance personnel,” said DOST NCR coordinator Teresita Fortuna. Given that the DOST has already used 4 Smart and Sun cell sites for its rain gauges, the partnership has saved the government around P80,000 to 100,000 ($1,807 to $2,260). “It’s ideal for DOST because our cell sites provide security for the rain gauges. In the past, the rain gauges would get stolen,” supervisor for Smart community partnerships Joyce Pamaligan told Rappler. Aside from Smart Communications, De La Salle University is the only other member of the private sector hosting DOST rain gauges. The partnership is part of an overall government initiative to increase the number of automated rain gauges all over the country in order to improve the accuracy of its weather forecasts. Liboro said there are around 1,400 rain gauges and water level sensors nationwide. The DOST aims to install these types of equipment in all 18 major river basins all over the country. River basins are particularly vulnerable to flooding when rivers overflow due to excessive rainfall. The government’s goal is to give communities at least a 6-hour lead time to prepare for flooding. Liboro said the DOST is targeting for rain gauges and water level sensors to be installed even outside river basins.